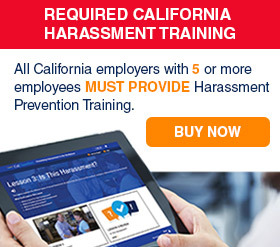 Compliance Alerts: CalChamber's 2019 Los Angeles City labor law poster and 2019 Los Angeles County labor law poster include increases to the minimum wage effective July 1, 2018. * The $13.25/hour minimum wage rate applies to employers with 26 or more employees; the $12.00/hour minimum wage rate applies to employers with 25 or fewer employees. All employers—regardless of size—with employees working in the City of Los Angeles, or working in unincorporated areas of Los Angeles County, are required to post the updated minimum wage notice with new rates. In August 2018, the City of Los Angeles issued a recommended update to the Fair Chance Initiative for Hiring notice, applicable to employers with 10 or more employees. 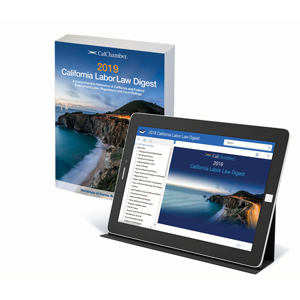 The second poster in CalChamber's 2019 Labor Law 2-Poster Set will reflect this update. If you want to order this updated poster separately (PLAFCL), please call Customer Service. 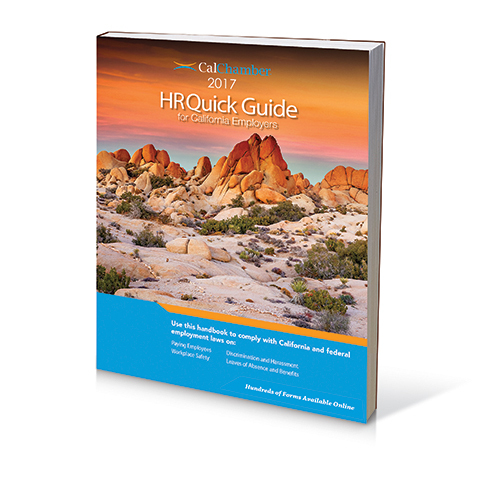 Do you have employees working in the City of Los Angeles? This single 17" x 22" poster (English and Spanish combined) contains the official Minimum Wage and Paid Sick Leave employment notices required by the Los Angeles Office of Wage Standards. These notices are mandatory for all employers, regardless of size, to post. 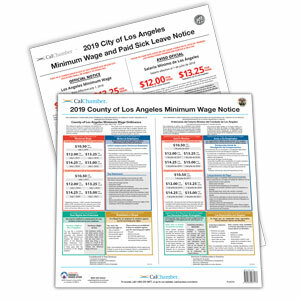 The first poster (17" x 22") in this set contains the minimum wage and paid sick leave notices required by the Los Angeles Office of Wage Standards; applicable to all employers with employees working in the City of Los Angeles. The second poster (17" x 14") contains the required official Fair Chance Initiative for Hiring employment notice limiting the use of criminal history information by Los Angeles employers—mandatory for employers located or doing business in the City of Los Angeles that have 10 or more employees in Los Angeles. Be sure to display the poster(s) in a clearly visible place at each workplace or job site. Employers who fail to comply with the City of Los Angeles minimum wage and paid sick leave ordinance, and/or the Fair Chance ordinance, may be subject to administrative citations, penalties or fines, and civil actions. Note: Employers must post the minimum wage and paid sick leave notices in any language spoken by at least five percent (5%) of the employees at a workplace or job site. *If you currently use the single July 2018 Los Angeles City Labor Law Poster containing Minimum Wage and Paid Sick Leave notices (also part of Labor Law 2-Poster Set) from CalChamber, you can continue to use it until June 30, 2019. The minimum wage rate will increase on July 1, 2019, at which time a new poster will be required. 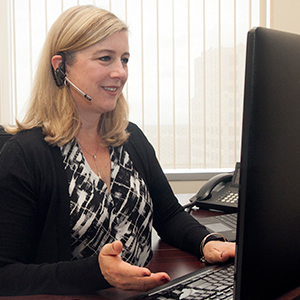 Do you have employees working in unincorporated areas of Los Angeles County? CalChamber’s 17” x 17” Los Angeles County Minimum Wage poster (English and Spanish combined) contains the official notice with the current minimum wage rates as required by the Los Angeles County ordinance—mandatory for all employers to post, regardless of size, with employees who perform work in the unincorporated areas of Los Angeles County. Be sure to display the poster in a conspicuous and accessible place at each workplace or job site located within the unincorporated areas of the County. Employers who fail to comply with the County of Los Angeles minimum wage ordinance may be subject to administrative citations, fines or penalties, and civil actions. 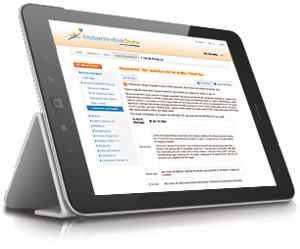 Note: The notice must be posted in English, Spanish, and the primary language used by the employer to communicate with each employee regarding the employee's work functions, if other than English or Spanish. *If you currently use CalChamber's 2018 Los Angeles County Minimum Wage Poster, you can continue to use it until June 30, 2019. The minimum wage rate will increase on July 1, 2019, at which time a new poster may be required.